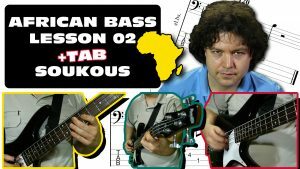 The above bass lesson is a typical example of soukous bass guitar with a sebene break. 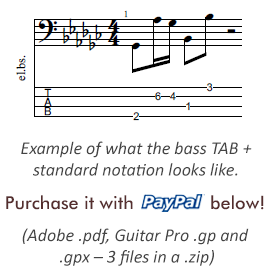 Don’t forget to download the tab (both pdf and GuitarPro in one package) below! The piece starts with a sparser, simpler part, played in the lower region of the fretboard. Don’t let this slower section make you think that it’s among the easiest ones at the same time. We’ll see why soon. The song builds upon a IV-V-IV-I + V-I-IV chord structure (both parts are played four times), in the key of Db major. If you want to attempt to play this example with fingerpicks and a thumbpick like I do, or even with bare fingers but in the closed palm style, the greatest challenge in the 1st, lower part will be the accurate execution of those 16th notes. These fast bursts are played with an alternating middle finger & thumb. I actually sometimes play a ring finger & thumb as well, depending on which string I am at during a phrase. There is a slight variation the 3rd time around the riff and after playing it the 4th time, there’s a long slide on the A string, from the 4th to the 16th fret. You need to land on that exact fret in time, but you can do it with style to inject some mojo into the piece. In the 2nd part, right after the long sliding pull, you are required to play the opposite of the quick rhythmic pattern you did in first section, namely an 8th note followed by two 16th notes. Whichever picking/plucking style you prefer, you’ll have to get into a groove that enables you to repeat this pattern over and over, across the A, D and G strings. What makes it a bit easier to do so is that it’s quite high on the fingerboard, in the octave area of the neck (12th fret). After the first time you played this sebene part, you continue with a long slide back down to the lower segment of the neck. After playing all of the above the 2nd time, the piece resolves with a 10th, which is basically a major 3rd an octave above the root note, and it implies a major chord of the tonic.